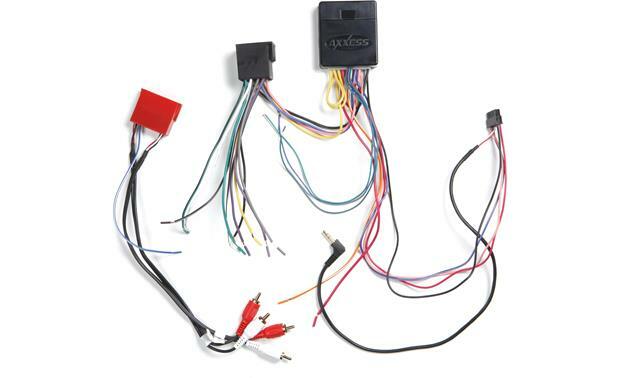 The XSVI-6515-NAV wiring interface from Axxess lets you connect your new car stereo to your Fiat 500's factory wiring harness. In addition to its power, ground, and speaker connections, this Axxess adapter also lets you keep your Fiat's factory Bluetooth, USB input, and the auxiliary input features. This versatile adapter can work with the basic Fiat audio system or with the upgraded Bose® audio system. If you're installing a navigation receiver, the XSVI-6515-NAV interface also offers the parking brake, reverse, mute, and Vehicle Speed Sensor (V.S.S.) outputs that you'll need. If you like that radio to keep playing after your Fiat's turned off, this interface also supports Retained Accessory Power (RAP) which keeps the music going until the door is opened. You can plug the Axxess steering wheel interface (not included) direclty into this interface, and keep your 500's steering wheel audio controls working with your new car stereo. Warranty: 1 year. Compatibility: The XSVI-6515-NAV radio replacement interface module allows you to replace the factory radio in a 2012-15 FIAT 500 vehicle (non-amplified/standard amplified system) with an aftermarket head unit. Product Features: The XSVI-6515-NAV retains the factory R.A.P. (Retained Accessory Power) and OEM Bluetooth/USB/3.5mm audio, as well as provides accessory/illumination outputs, plus navigation outputs (parking brake/reverse/mute/VSS) for aftermarket head unit installation. Accessory + Illumination Outputs: There is no 12-volt accessory wire in the factory harness, which requires the installer to run an accessory wire to the fuse box or underneath the steering column when installing an aftermarket radio. The XSVI-6515-NAV is designed to provide a 12-volt, 10-amp switched accessory output (red wire), along with a illumination output (orange/white wire) to make installation simpler. Navigation Outputs: The XSVI-6515-NAV provides essential wires required for aftermarket radios that have navigation. VSS (Vehicle Speed Sense), Reverse*, and Parking Brake wires are provided. This helps to cut down the installation time, since the installer does not have to look for these wires in the vehicle. Retained Accessory Power (R.A.P. ): The Retained Accessory Power (R.A.P.) function supplies power to the radio after the ignition is shut off until one of the front doors are opened. This function is retained by the XSVI-6515-NAV interface. Retained OEM Bluetooth/USB/3.5mm Audio: The XSVI-6515-NAV includes an additional harness which allows you to retain your factory Bluetooth/USB/3.5mm audio sources. The harness features two sets of stereo RCA connectors which will plug into your aftermarket head unit's rear-panel auxiliary inputs. * Note: If your Fiat 500 has a manual transmission, the reverse wire connection will have to be hardwired. This is because the reverse signal travels along the can bus, and connection to the interface is not possible. OEM Steering Wheel Control Compatible (optional): The XSVI-6515-NAV interface features a right-angle 3.5mm connector that lets you keep your vehicle's OEM steering wheel controls via the optional Axxess Steering Wheel Control Interface (120ASWC1, sold separately). Color Codes: Wiring up the XSVI-6515-NAV is like wiring up any other wire harness that would attach to an aftermarket radio's harness. The Metra/EIA wire code can be found on the back of the interface's package that will aid you in the wiring of your aftermarket radio The XSVI-6515-NAV interface contains the following wire leads. According to Metra, the newer revision of this harness has a standard USB port for upgrading/downgrading the firmware. Is this true? Because I don't want to spend $50 extra to fix the firmware to work with my Fiat (this is a known issue). Searches related to the Axxess XSVI-6515-NAV Wiring Interface Connect a new stereo and retain the factory Bluetooth, USB, auxiliary input, and RAP in select 2012-up Fiat 500 vehicles.